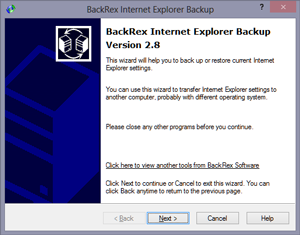 BackRex Internet Explorer Backup is a backup and restore tool for Internet Explorer. It allows you to backup favorites, history, proxy settings, fonts, dialup accounts, autocomplete passwords and cookies. 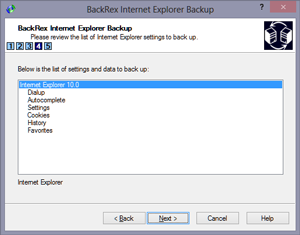 BackRex Internet Explorer Backup can help you to move all your Internet Explorer settings from one computer to another, even if it has a different version of Windows and/or Internet Explorer installed (for example from Internet Explorer 9.0 to Internet Explorer 10.0 or vice versa). What exactly is backed up? Internet Explorer versions 6.0, 7.0, 8.0, 9.0, 10.0, 11.0 are supported. Easy to use intuitive wizard interface. Saves Internet Explorer autocomplete passwords. Backup jobs can be scheduled to run on a regular basis. Should you have any questions or require assistance in purchasing or using this software, please do not hesitate to contact our customer support service! Note: Windows®, Vista®, PowerPoint®, Outlook®, FrontPage®, Office® are registered trademarks of Microsoft Corporation.